Why SMPE ABS Sensors ? SMPE offer a complete range of over 850 ABS Sensor part numbers covering 12,000 application listings and come with a 2 year or 30,000 mile warranty. All ABS sensors are OE quality and thoroughly tested before becoming available to the Aftermarket. Symptoms of abs sensor Failure - ABS/DSC warning light illuminated on dash board. Brakes locking under severe conditions. Maintenance - Inspect for damage or corrosion at sensor and sensor terminals at time of routine service and brake maintenance. 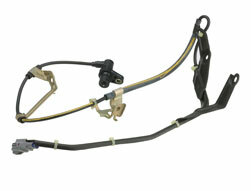 Check ABS sensor for build up of dirt or debris which may affect performance. Brands -ABS Sensors are currently available in the following brands: Intermotor, Fuel Parts and Kerr Nelson.